Lately I’ve had the bug to sew using my huge crate full of vintage lace fabric that has been sitting in my studio calling softly. 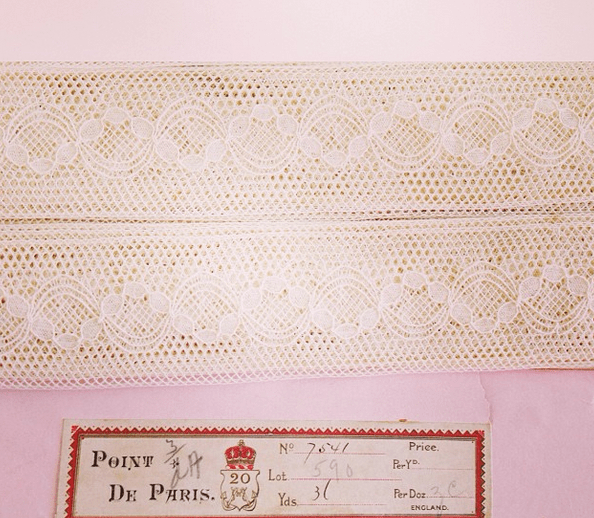 Most of the lace was found on various brocante hunts in France and I have had this project in my head for sometime now. I purposefully left my sewing machine out in plain sight all of last week and began tediously and lovingly selecting, cutting and pinning pieces of this precious vintage lace fabric. If you love lace, this post Decorating With Lace has some more ideas on using lace fabric in a modern home. Salvaged from garments, old bedspreads, vintage lace fabric pieces and remnants, and unused trims on cards. Much of it is French…some of it victorian Americana. 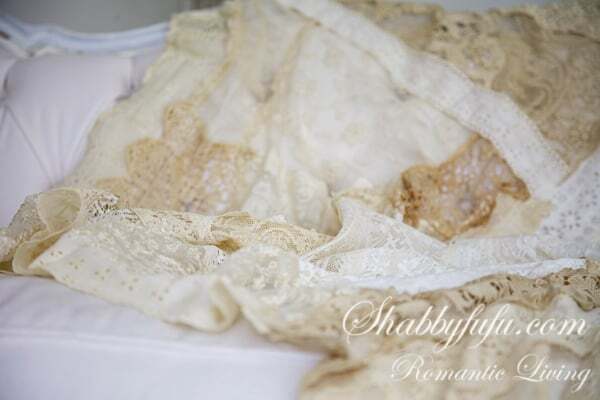 In my vision I could see this used as a vintage lace wedding dress in a modern day wedding. 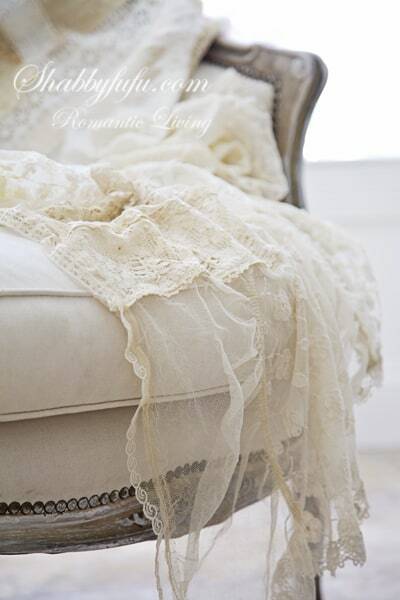 It’s been made into a throw…or tablecloth and is delightfully ethereal with it’s wispy lace. And with no particular client in mind, it has been sold and is on it’s way to a wedding as a bridal gift in just a couple of days. A serendipitous piece from the studio. I have been using old lace for the dollhouse. 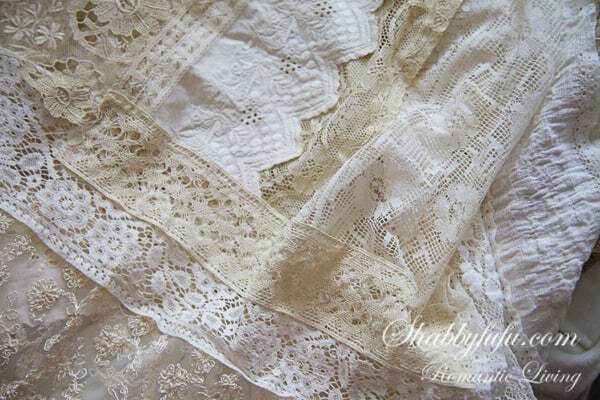 Its hard to find nice fine old lace, and you have a wealth of it! So pretty! That was one beautiful collection of lace, Janet! I have some shirts with loads and loads of beautiful lace on the bottom that are too big for me now iwas going to try and sell them, but now I think I’ll just drag out my old handy dandy seam ripper and save that gorgeous lace to start my own collection! HA! It would be beautiful on some romantic bedroom pillows! What do you thinks? Should I sell as is with lace or destroy it and save the lace? lol! Have a great weekend! Hi Sheila…happy weekend! I guess it depends on if you think it’s worthwhile cash wise to you to sell. I used to make a lot of pillows and runners with lace back in the day and have loads of scraps left! Lace is timeless in my opinion. I want to wrap the pieces around s wreath. Do I glue, Pin,or sew them on the wreath? Hi Linda! It depends on what the base of the wreath itself is. If it’s styrofoam you can just pin it. If it’s something like a grapevine wreath than hot glue would work best. Sounds like a fun project!